Here’s what I had for lunch today! Lunch. I look forward to it more than anything while I’m at work. It’s important for me to fuel up at lunch or else I’ll fall deep into Zombieland. 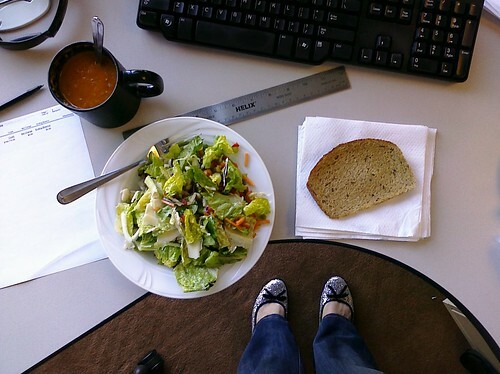 Over the past few years, I’ve taken photos with my camera phone of my lunch at work. Yes, I am weird. Don’t worry, my coworkers think so too. 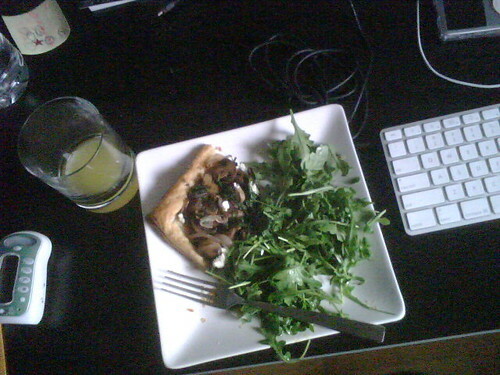 There’s PLENTY of days where my lunch is not photo-worthy. But every now and then there’s something fun, different and new in my rotation. I’ve decided to share some of them with you. Most of the lunches below are leftovers of something I made the night before, or something I had in my freezer. 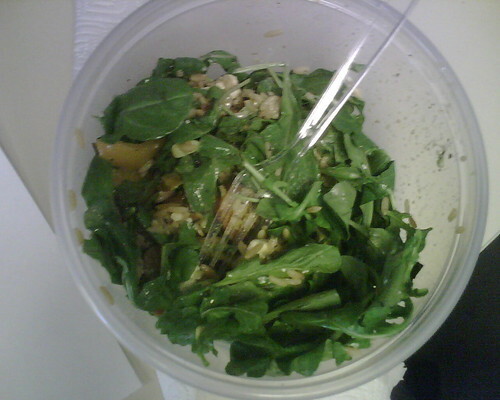 Some of the lunches are just random things from my fridge- especially the salads. I like to bring a big bag of ingredients to work (the fridge at work is big) and assemble my food in the kitchen. 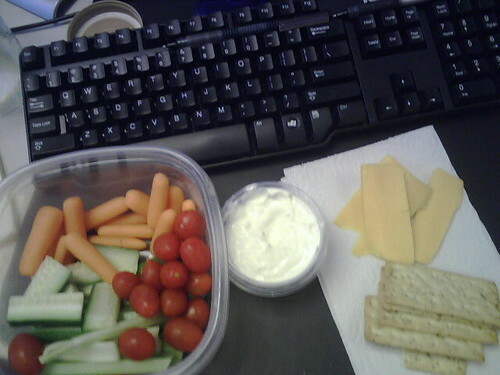 The act of making my lunch is also a good break from number crunching. My point is, please don’t limit yourself. 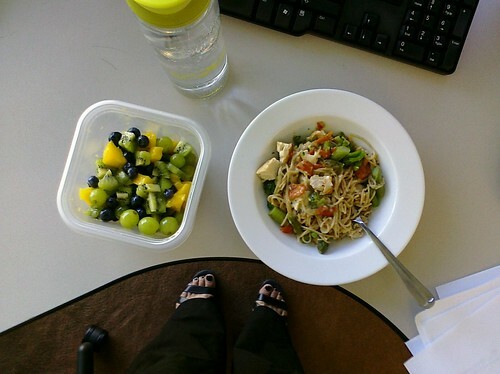 As long as you have a microwave & fridge, you don’t have to have boring lunches at work. If you have a toaster or a toaster oven, you are soo golden. We used to make french bread pizzas in the toaster oven at my old job. Talk about FUN. 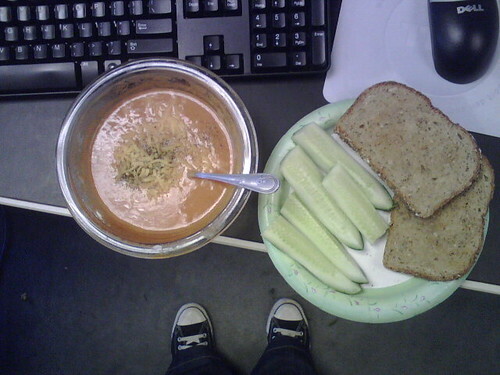 Anyways I hope these photos give you some inspiration for your boring old lunches. And yes, I am a dork. I freely admit it. A dork who loves food, camera phones and lunch! Brace yourself! 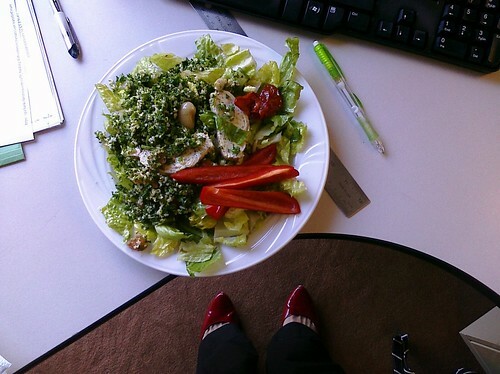 Here’s a greek salad with tabbouleh, red peppers & chicken. There’s my favorite mechanical pencil and pen in the picture too! Here’s a little salad with red onion, mixed greens, carrots, feta, cucumber & some toast! My fuel for the afternoon of Financial Summary entries. 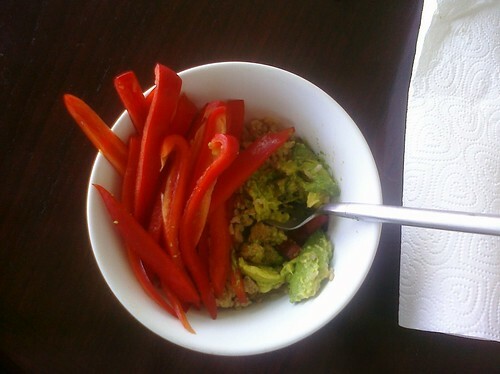 Here’s leftover Thai Basil chicken over rice with avocado and sliced red peppers on top! Here’s a nice little Italian dressed salad with cannelini beans and shaved Parmesan. I warmed up some creamy Trader Joe’s Red Pepper Tomato soup in a mug, and toasted some bread to go with it! 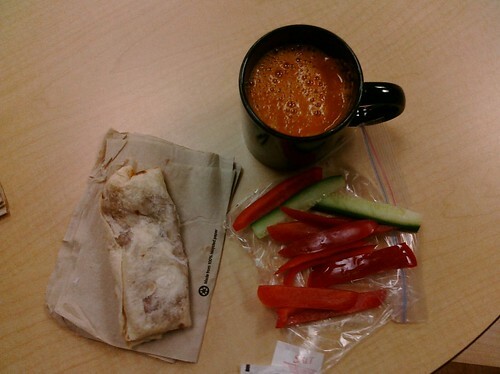 This day, I brought a freezer burrito to work with some sliced red bell peppers & cucumbers. I heated up some Trader Joe’s Tomato Soup to help fill me up. Here’s some leftover Thai veggie green curry on top of rice! Here’s an Asian slaw I fixed at work. 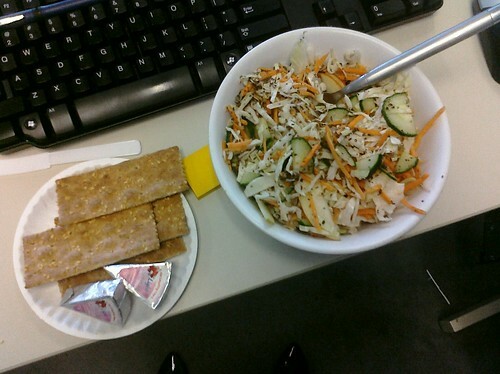 There’s cucumbers, cabbage, sesame seeds, carrots, onions & apples with a bottled sesame dressing. I had a few Ak Mak crackers and some Laughing Cow spreadable cheese on the side. Weird combo. But it made my tummy stopped growling. Leftover homemade Garlic Naan, sliced apples & Spiced Indian Chickpeas. Yummy!! 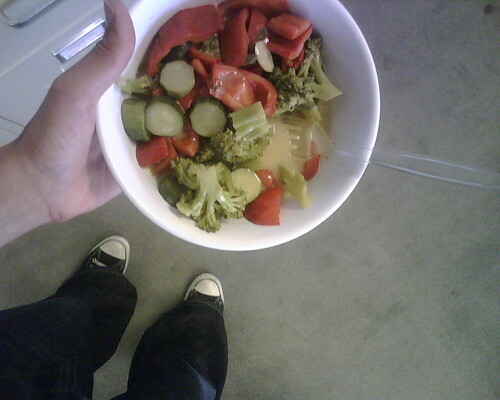 Veggies & dip. Aged cheddar with crackers! Super simple. 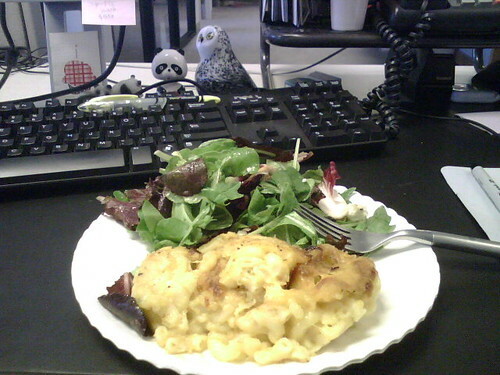 Leftover Creamy Mac & Cheese with a nice little green salad. See my panda & owl collection? I love them. Here’s some cucumbers with a splash of rice wine vinegar. I made a smashed potato with butter in the microwave. 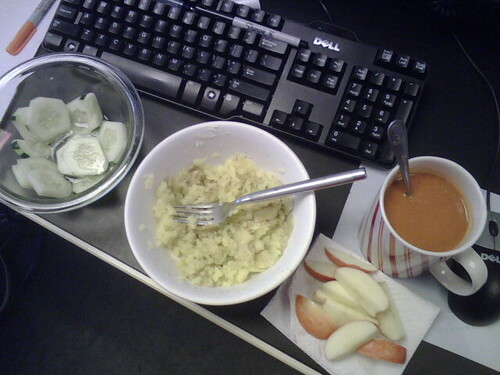 I heated up some Tomato soup and cut up some apple slices. I think I ate this when I was pregnant so don’t judge my randomness. The point is, you can bring a potato to work and make something delicious out of it! All you need is a microwave and a potato. Here’s a sandwich I made at work. What’s in it? 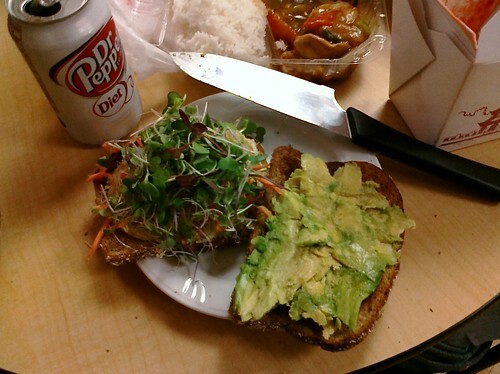 Avocado, garlic hummus, micro greens and shredded carrots served on toasted multigrain bread. I like my Diet Dr. Pepper. It tastes just like the real thing! Here’s a little salad I threw together. 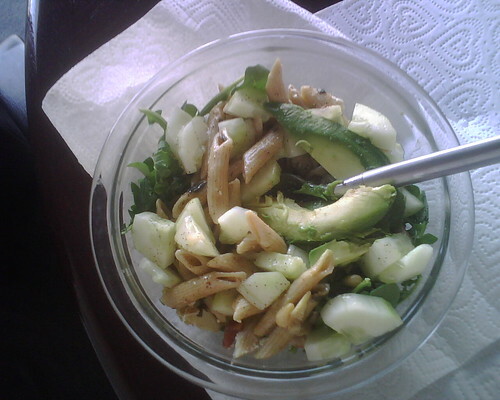 It has avocado, cucumber, penne, pine nuts, lettuce & sun dried tomatoes in it. I poured a little bit of Italian dressing on top. Makeshift pasta salad time! This is a favorite of mine! Vegan mexican fried rice. 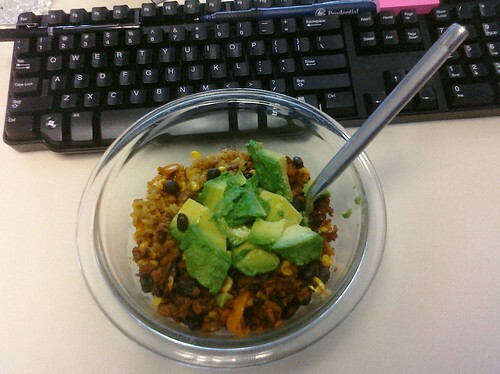 There’s soyrizo, cilantro, black beans, bell peppers, corn & avocado in it. I know this isn’t the most appetizing lunch, but it sure was tasty! 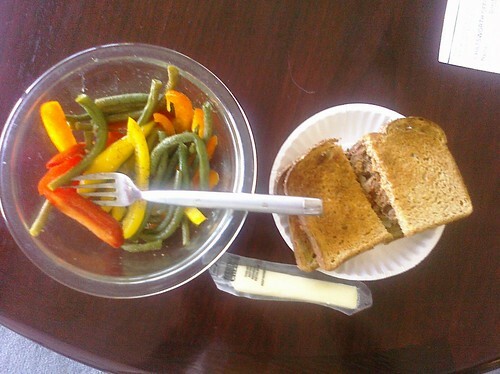 Turkey meatloaf sandwich with a pepper & string bean salad. I threw in a stick of string cheese for good measure. Here’s some leftover Tex Mex Enchiladas. Carrot, celery & dip! 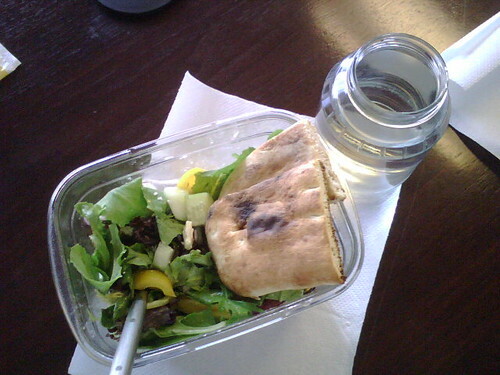 Here’s some toasted naan and a salad with yellow bell pepper, cucumber, and red onion! Drink your water. It’s important! Here’s more of that Red Pepper Tomato Soup from Tj’s that I love. I topped it with some cheddar. Served it with some toast & cucumber rods. 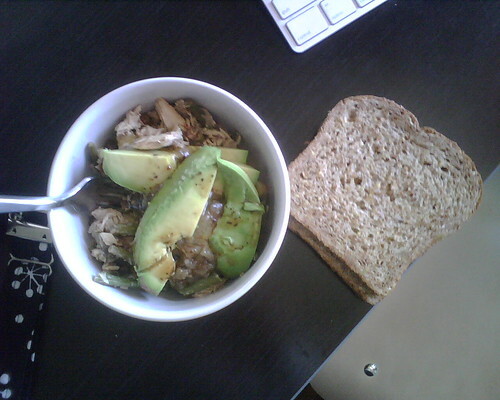 Here’s a tuna salad with avocado in a bowl concoction- served with toasted bread. Make your own sandwich, lunch! This picture doesn’t do it justice! Sausage, rice, arugula, pepper, feta & avocado salad. It was a leftover dinner made into a salad for lunch! 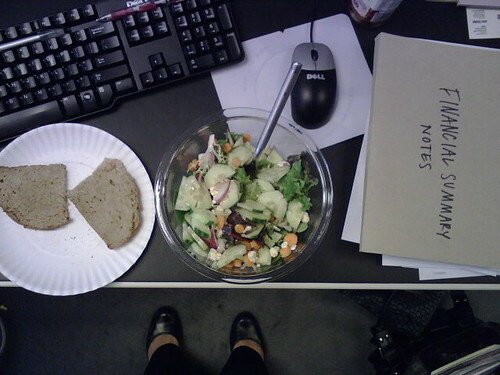 This is my “OMG I ate a sinful dinner last night”- lunch. 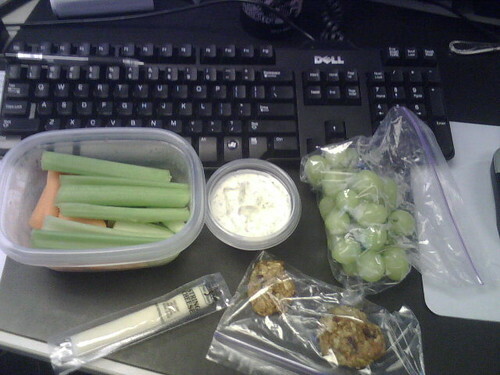 String cheese, grapes, veggies & dips and a few Oatmeal Raisin Cookies cuz I always need something small & sweet at 3pm. 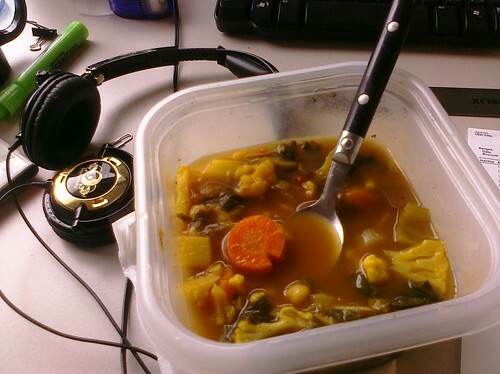 Here’s some Vegetable Minestrone I brought from my freezer. 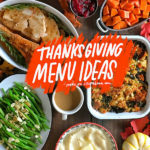 I make a batch of soup with the leftover veggies in my fridge once a week and stock up my freezer for this very occasion. And here’s that Asian Mango Slaw I made. 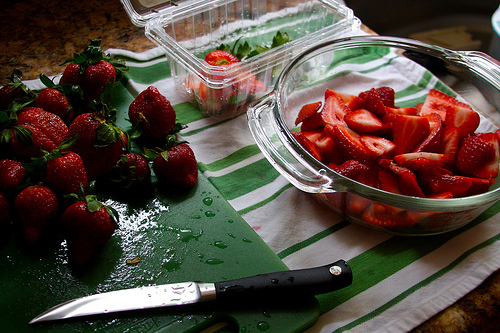 SOOO good the next day. 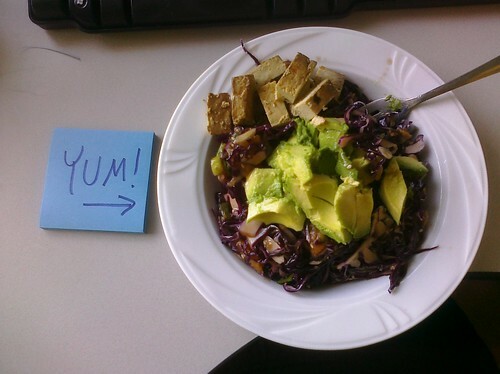 Especially with avocado & baked tofu. So there! Don’t give me any excuses. 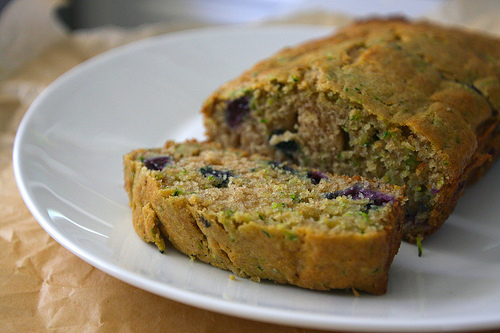 Stop bringing boring lunches to work! I’m gonna call HR on you! i want to eat everything you eat. yum! hee hee! i’m glad you like rods! I return to full-time work in two weeks’ time and I’ve been thinking about my lunches – thank you so much for the pictorial inspiration! 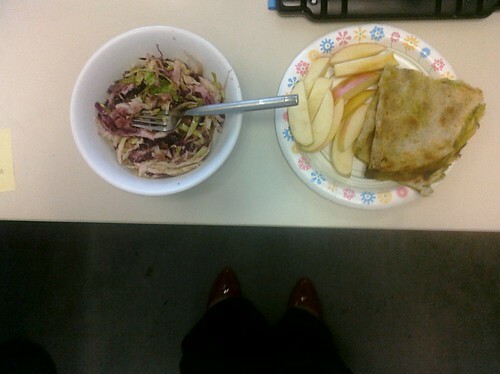 Your lunch ideas are great, but I am equally amused by the shots of your shoes. They gave me a chuckle — and I like the glittery flats! A random compliment, I know. And I love those bolanis too. So good. How fun! I always make my own food at work too. Usually pretty much the same old salad everyday, which looks good, but might make for a bit of a boring photo series 😉 Btw I think I enjoyed looking at your shoes as much as the food! What a yummy menu! I love posts like these that give me a choice. Amazing. Great post! 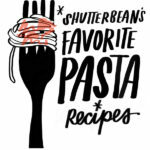 I always get bored with my at work lunches after I’ve been working from home for awhile – leftovers just aren’t as good as the freedom to cook something for lunch. I guess I just need to plan ahead a little better (especially for healthy snacks, being pregnant). OH, what a fun post! I eat very similar lunches, and always get the Lean Cuisine and takeout people coming over and saying “ohh, what’s that? !” with an odd look on their face. It makes me feel like I’m weird one every time they do it, but this is proof I’m not alone! 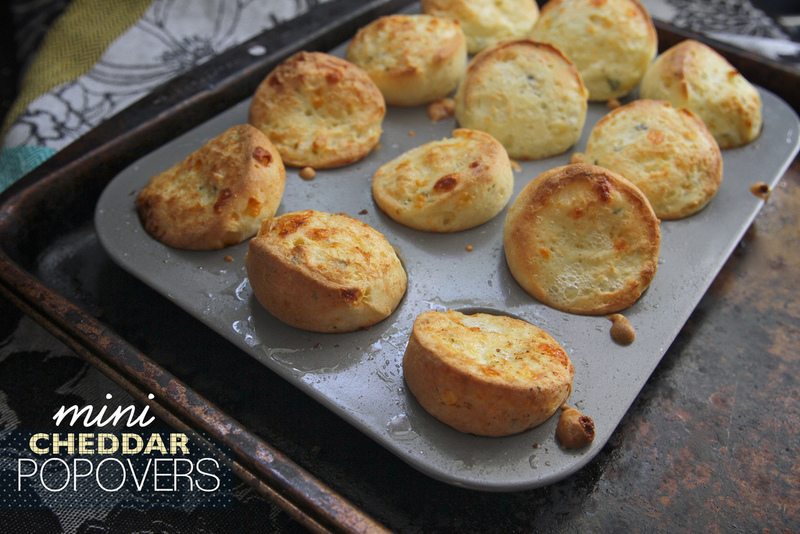 …and I LOVE those ak-mak crackers (w/sesame)! I just discovered them myself and they are awesome. 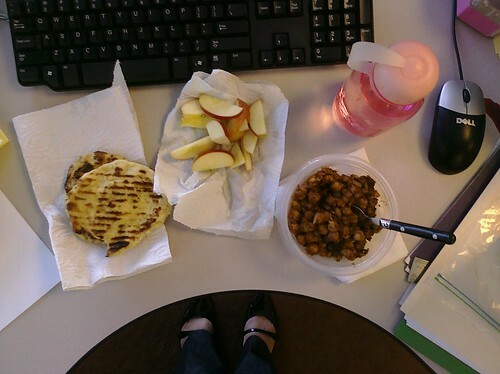 I documented my lunch with photo today, inspired by this post! 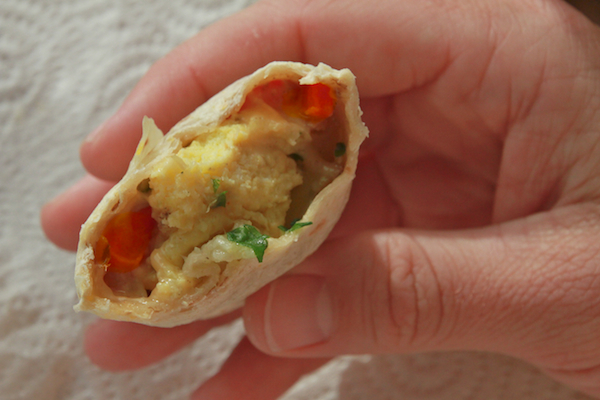 Some gorgeous ideas here, I am trying to get away from usual sandwiches. Loved this post! 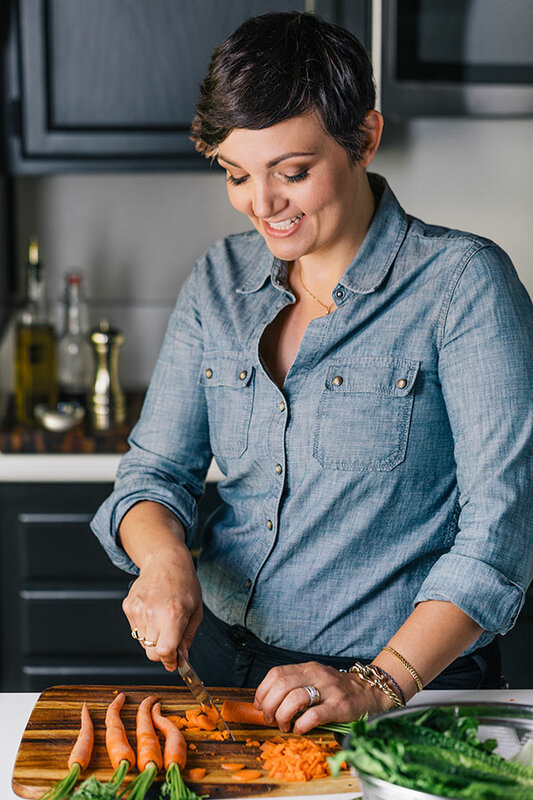 I have to ask… what kind of dip do you buy/make for your veggies? I am always looking for some new ideas! 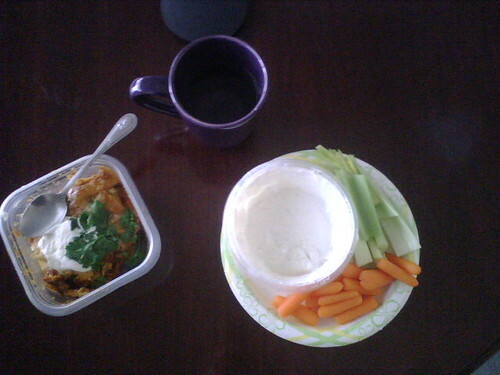 For awhile, I used the Ranch packet and mixed it with greek yogurt or sour cream. Now I use a store bought salad dressing and mix it in greek yogurt. Hope this helps! haha! thank you! I loooove my shooz! This might be my favorite post I’ve ever read here and I love them all. 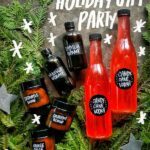 These are SO creative and look SO good! I have the ingredients to do the salad with cucumber and feta, I think I’m going to go and make that for dinner. 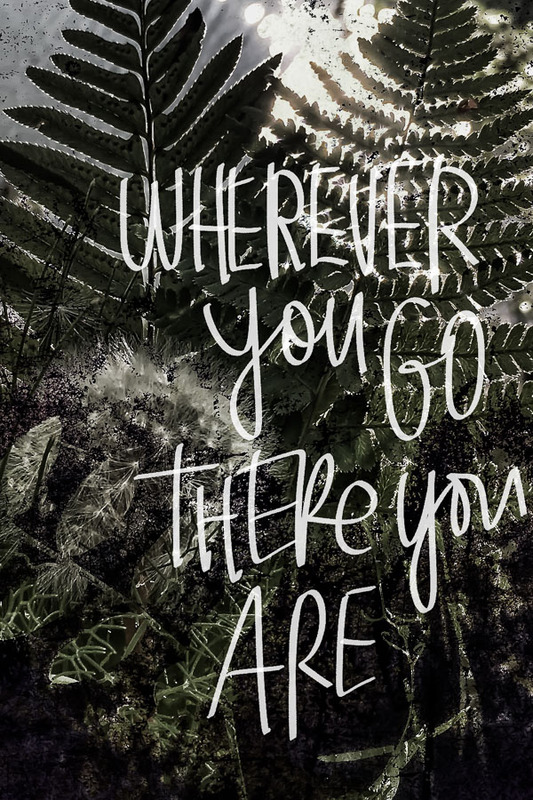 Thank you for sharing this – very inspirational! Ummmmmmm, helllllo so how much do I LOVE this post? And it was the post that kept on giving…..SO MANY AMAZING OPTIONS!!!! You need to make this a book. 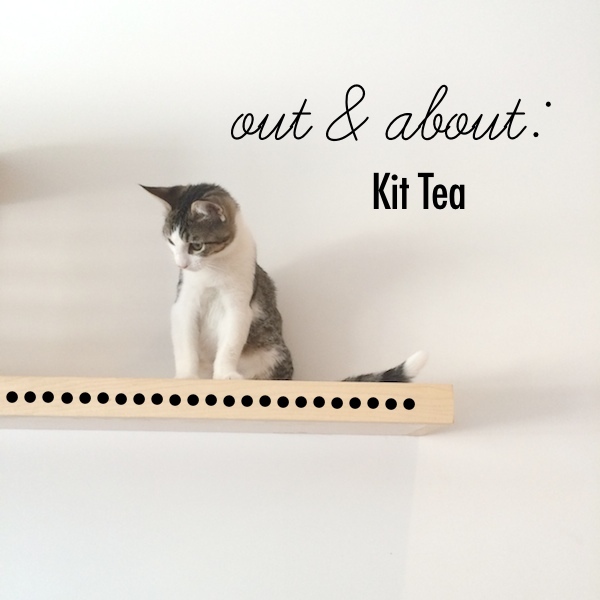 Love this post and love your cute little shoes in the pics as well!!! Thanks for sharing some great lunch ideas!!! i love all the pics. 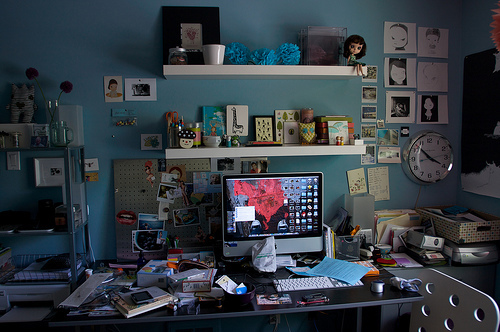 it’s nice to see what you keep on your desk! yay cucumber rice vinegar! love ewe. If we were to eat as well as you do here, we would all be dynamic. I felt energized just but looking and reading about your healthy concoctions. Thanks Diana!!! You have a lot of good ideas too! 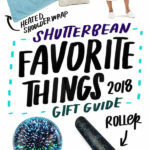 Can’t wait to look through your site! beautiful pics, everything looks delicious, and oh so healthy. Very inspiring. Please, please please post a recipe for the vegan fried rice.. looks amazing!! I LOVE those red shoes that make an appearance in a few pictures! Where are they from? 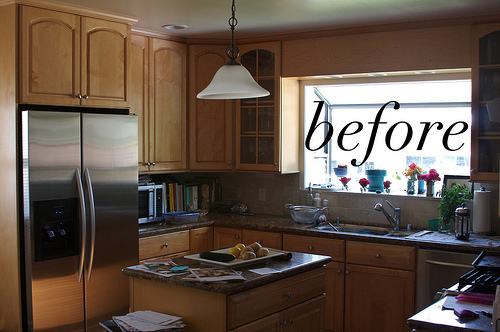 It all looks so good – I am mentioning this post in my weekly link round-up! Though I may be a little crazy cos I stared at some of the pictures thinking, are those teeny tiny feet? Is she standing on her desk? Till I realised that clearly my depth perception is wonky and actually you have normal sized feet and are standing on the floor in front of the desk!